The Invacare® Tracer SX5® Deluxe Wheelchair is similar to Tracer EX2® but comes with flip up armrest panels and nylon upholstery representing an excellent value. Dual axle position for the rear wheels allow the seat height to be either 17 1/2" or 19 1/2"
The Invacare® Tracer SX5® Deluxe Wheelchair ships for free (including the optional accessories) to the lower 48 States. If you are in Alaska or Hawaii, please contact us during business hours so we give you a price for shipping. The Tracer SX5® Deluxe Wheelchair is available with either a desk length or full length armrest side panel. Both armrest side panels flip back (but are not removable) for easier entry and exit. The height of each length is fixed (non-adjustable). The desk length armrest side panel features an armrest pad approximately 10 inches long allowing the user to roll up to a table or desk to work or eat more comfortably without having to lean forward. The full length armrest side panel features an armrest pad approximately 14 inches long. A longer armrest pad may be more comfortable for some users. 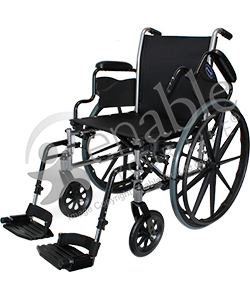 The Tracer SX5® Deluxe Wheelchair can be had with either standard footrests or elevating legrests. For most users, the choice depends on doctor advice and recommendation. Both options swing out of the way (without removing) allowing for easier entry and exit. Elevating legrests feature calf pads and can be elevated roughly so that the legrest itself is parallel to the ground. Legrests are a little heavier and more cumbersome and are usually chosen on the advice of a physician. In addition to the armrest and footrest options, you can choose from the following optional accessories for your Tracer SX5® wheelchair. Anti tippers - This safety item fits on the rear of the wheelchair and keeps the wheelchair from tilting backwards. They can be removed when not needed. Wheel lock extensions - these bars slip over the wheel lock handle and extend the handle 8" making it easier to grab. You can read the owners manual and warranty here. Folded width is approx. 13.5"
Seat width is 16", 18", 20", or 22"
Comments: A nice overall wheelchair if not a little pricey compared to some of the other wheelchairs out there - but I guess you get what you pay for. Comments: I bought this wheelchair for my wife because it has nylon upholstery. It gets hot here in AZ and she now doesn''t stick to the seat!